Joe knows that the best part of waking up is fresh coffee, and that's why he'll bring a hot cup to your bedside to help you start your day. Joe is smart enough to avoid obstacles lying around your house while seeking you out to deliver your morning cheer. What's more, he makes sure he finds you and not your roommates by way of a special IR-beacon. Once Joe finds you blissfully sleeping in the morning, he ensures you won't over-sleep with his built-in, 90dB buzzer. It's like getting woken up by a dump truck in reverse! The coffee cup is the snooze button. Once you've retrieved your tasty, caffeinated payload, Joe will leave you be for 10 minutes, allowing you to enjoy that first cup in the morning. Then, he'll sound his alarm one last time, ensuring you've gotten out of bed. Joe on the go is the over-sleeping, coffee-drinker's dream come true. It's fully autonomous, using a variety of sensors and special electronics to make the magic happen. 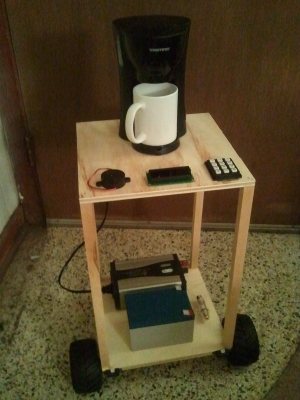 So far, Joe employs around 8 different sensors and actuators, ranging from IR range finders for obstacle avoidance, to a high-current relay and power inverter to power the coffee maker. The robot pictured to your left is the current prototype of Joe, with the front controls' installation coming soon.